Is a Gerontology Career in Your Future? Social work competencies complement the knowledge and skill sets required for gerontological careers. That synergy, coupled with growing number of older adults, creates promising career prospects in the field of aging. It’s no secret that the tidal wave of baby boomers is crashing on our shores. In 2011, the first wave of boomers will turn 65. By the year 2030, all 78 million will have done the same—almost double the number of people this age and older in 2005, according to “Retooling for an Aging America: Building the Health Care Workforce,” a recent report by the Institute of Medicine. With this huge demographic bearing down on the U.S. healthcare system, social and healthcare services shortfalls will plague our society. At worst, serious shortages in healthcare personnel and delivery of sorely need social services will result in significant gaps in older adult care. Baby boomers are also forcing social workers “to reshape the current delivery of services, as well as redefine aging and what it means to be old,” according to Sharon Raver-Villanueva, MSSW, program manager of OnLok Lifeways in San Francisco. Raver-Villanueva admits that boomers, typically denying their age and choosing to overlook the aging process itself, probably won’t want to participate in the traditional models of care such as senior centers. But what types of services, activities, medical care, entertainment, and living arrangements will they want? As boomers exert pressure toward changes in addressing the many aspects of aging, social workers are perfectly positioned as trailblazers in an era when gerontology presents an exciting opportunity to ride the wave, help craft the vehicles for service delivery, and assume the positions that will direct aging Americans through uncharted territories toward a healthful, dignified, enjoyable, and rewarding aging process. Where social workers are concerned, gerontology offers the “perfect hybrid career,” according to Jolene Fassbinder, MSG, MACM, geriatric education center manager at the David Geffen School of Medicine at the University of California, Los Angeles. As a stand-alone discipline, gerontology intersects with other disciplines involving programs, products, and services related to the aging population. The challenge, Fassbinder says, is translating competencies to employment. Social work training lays the groundwork for gerontology competencies, including general skills, writing, communicating, project management, and ethics. Functioning in the field of gerontology requires extrapolating those skills and honing them in specialized areas related to older adults. “Social workers have the absolute best training and education to work with the older population because of their holistic perspective,” says Monika White, PhD, executive vice president for external affairs and program innovation at WISE & Healthy Aging in Santa Monica, CA. White says social workers are clinically trained to establish relationships with people. Using their training in systems perspectives with families, groups, and communities, social workers learn to identify issues, interview effectively, and probe situations in order to utilize their problem solving, mediation, and facilitation skills. Seeking to identify and classify problems in social functioning via the person-in-environment (PIE) system allows social workers to understand clients experiencing problems with self-perceptions, their individual roles, and interactions with others, all within the context of their environments. Basic social work competencies easily translate to gerontology. “Clinical and systems knowledge are extremely useful with this population,” White says. In fact, working with older adults should be part of all field experiences in social workers’ training, she says. The exposure not only prepares them for interaction with that specific population but also provides an introduction into a broader arena desperately in need of personnel equipped to address the many aspects of aging. Although addressing workforce shortages in the field of gerontology remains a challenge, efforts are in place to gerontologize accredited social work programs throughout the United States. This involves embedding gerontological competencies into the core curriculum and organizational structures of social work programs. The large number of older adults creates a critical demand for professionals in the field of gerontology. In the United States, one person in eight is over the age of 65, and the fastest growing age group in U.S. society includes people aged 85 and older. By the middle of this century, one in five Americans will be over the age of 65, and the population will include 15 to 18 million people over the age of 85. Programs are in place to bolster the number of professionals committed to our aging population. Though it’s only a modest beginning to a solution that experts hope will continue to grow, it’s at least a start. Through a project funded by the John A. Hartford Foundation, the Council on Social Work Education (CSWE) Gero-Ed Center in Alexandria, VA, has infused specialized information and coursework designed specifically to address aging and gerontological issues into its curriculum. Given that nearly 75% of social workers are involved in some capacity with older adults but have no formal preparation in that area, according to a national National Association of Social Workers’ survey, the CSWE Gero-Ed Center’s innovative curriculum is a much-needed movement in the direction of adequately preparing practitioners to deal with the oncoming wave of older adults. “The thrust of the Gero-Ed Center is to bring [interaction with elders] into the curriculum with the intention that every graduate will have certain underpinning skills to deal with older adults,” says Julia Watkins, MSW, PhD, executive director of the CSWE. It involves concerted efforts toward creating opportunities for social work students to work with older adults. “We don’t leave that to happenstance,” she says. Exposure to this growing population will change recruitment challenges for the better, according to Ashley Brooks-Danso, MSW, codirector of the Gero-Ed Center. “Older adults are linked to all the fields of practice within social work,” she says. And in the field of gerontology, the needs are “across the board in all areas of working with older adults,” she says. The CWSE has trained its faculty to pass along knowledge of topics related to aging issues to social work students, with funding in place to implement specialized training to help faculty infuse gerontological education into various programs, Brooks-Danso says. The practice has been in place for 10 years. The fit between social work and gerontology is ideal, according to Watkins. 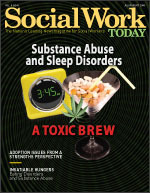 Social workers’ knowledge, skill development, understanding of individuals and environments, life span development, intervention capabilities, and support within the community create a “wonderful fit for working with the aging population.” Specific social work competencies intersect with gerontological areas such as mental health, substance abuse, physical neglect and abuse, and diversity, she says. Brooks-Danso cites the “intimidation factor” as one of the barriers to social workers’ foray into the field of gerontology. She says social work students tend to be younger, and some are intimidated by working with older adults. Some question older adults’ respect for their professional knowledge and find it to be an obstacle to gerontological pursuits. Although there’s no specific data to support her belief, Brooks-Danso says it appears that older professionals are the ones most likely to work with older adults. “Possibly it’s due to the exposure to working with their own parents,” she suggests. From an educational perspective, Watkins says younger social workers are becoming more cognizant that the aging population doesn’t fit the old stereotype of fragile elders confined to nursing homes. “That’s just not accurate,” she says, noting the diversity among older adults’ ethnicity, health status, interests, and other factors. And with the incredible demand, gerontology continues to become a more attractive area for professionals. Promising opportunities exist not only within healthcare but also within the corporate world, which Brooks-Danso says holds appeal for its lucrative possibilities. Both Watkins and Brooks-Danso continue to examine solutions that will break down barriers and opposition to social workers entering gerontological fields. They realize the average pay is low for gerontological social workers. “The student debt burden is great, and the salaries are not very high,” Watkins admits. But she and her colleagues are looking into legislation changes that would forgive student debt for social workers in the field of aging. “Substantial loan forgiveness would be an attractive draw into the field,” says Watkins. Both the need and the promise exist for social workers to transition their careers toward the field of gerontology. “But there is not an adequate pipeline,” says Watkins, noting that the pipeline is the precise target of CSWE. “People need to come to realize that [gerontology] is going to be a high-demand field,” says Brooks-Danso. Employment of social workers is expected to increase by 22% from 2006 to 2016, well above the average growth for all occupations, according to the U.S. Bureau of Labor Statistics. Sparked by the burgeoning older adult population, the demand for healthcare and social services will create excellent job prospects for gerontological social workers. While Raver-Villanueva warns that “working with older adults is not for the timid,” she quickly points out that emotional and financial rewards await gerontological professionals who are culturally competent, possess strong knowledge of the healthcare delivery systems, recognize appropriate methods for accessing various social service programs, and are familiar with the workings of the aging network and benefits eligibility criteria. “The sky is the limit,” she says of professional gerontological prospects for social workers. Any business providing products for older adults, or created to serve or support an elder or caregiver, will benefit from the knowledge and expertise offered by gerontologists, according to Raver-Villanueva. “Gerontologists add tremendous value to a wide range of businesses and industries,” she says. “There are tremendous opportunities for social workers who go into gerontology,” White agrees, citing not only healthcare options but also business, industry, and private geriatric care management. “It’s a multimillion dollar business,” she says. Among the most obvious opportunities for social workers who transition in the field of gerontology is a “home care agency of geriatric care managers who have their own practices,” according to White. Gerontologists could also assume roles in quality control, monitoring various products and the way they’re marketed and sold, which can become an ethical issue, according to Timmerman. A professional with a gerontological background would be helpful in developing marketing strategies in various business settings, such as pharmaceuticals, she says. She also sees increasing prospects for professionals with social work backgrounds doing well in the field of human resources. Exciting new professional opportunities are likely to materialize in areas such as health and fitness, life coaching, and financial planning. There are niches for nurse underwriters to work with claims administrators in the long-term care insurance field, home care opportunities, day care administration, and financial institutions. Those with social work backgrounds have trended toward careers with banks, law offices, geriatric care management, and EAPs, according to White. “Eldercare is huge in the employee assistance arena,” she says. “There are jobs that are hidden within industry that you wouldn’t think about,” says Timmerman. Among former social workers who have transitioned into gerontology careers, Raver-Villanueva has found that in most cases they had a professional or personal experience that “really touched them intimately and personally.” They recognized the wisdom of older adults and “realized how much they had to learn just through hearing the stories and knowing the life experiences endured by many older adults,” she says. Ultimately, they feel a great personal reward and connection through this work. “There is great satisfaction that social workers receive in knowing that they made a difference but it’s icing on the cake when the older adults we serve make a difference in our lives or touch us personally. At that point, the magic has happened,” she says. — Barbara Worthington is an associate editor at Great Valley Publishing Company. According to the U.S. Department of Labor Bureau of Labor Statistics’ Occupational Outlook Handbook, in 2006, healthcare was the largest single industry, providing 14 million jobs. Between 2006 and 2016, healthcare will generate 3 million new jobs, more than any other industry. This includes many opportunities for careers in gerontology. • knowledge of ethical and legal obligations (such as adhering to principles of self-determination).